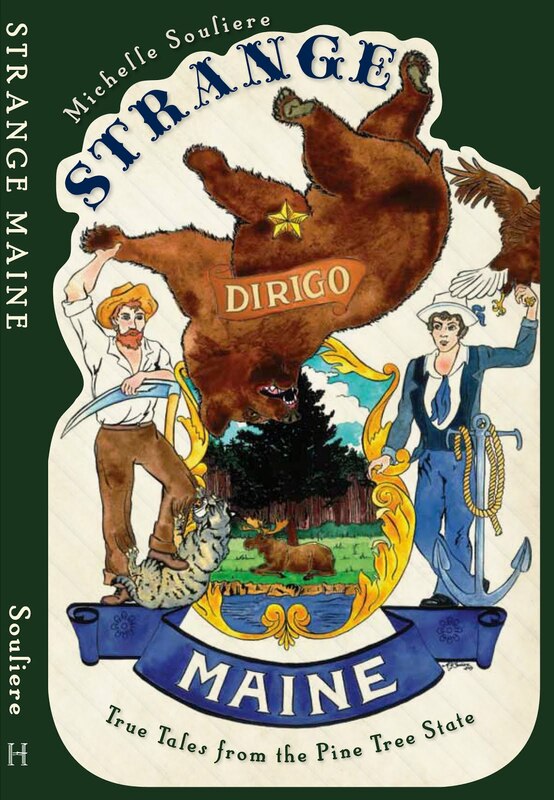 Strange Maine: Review: Umbrella Cover Museum guide! Review: Umbrella Cover Museum guide! What can I say about Uncovered and Exposed! 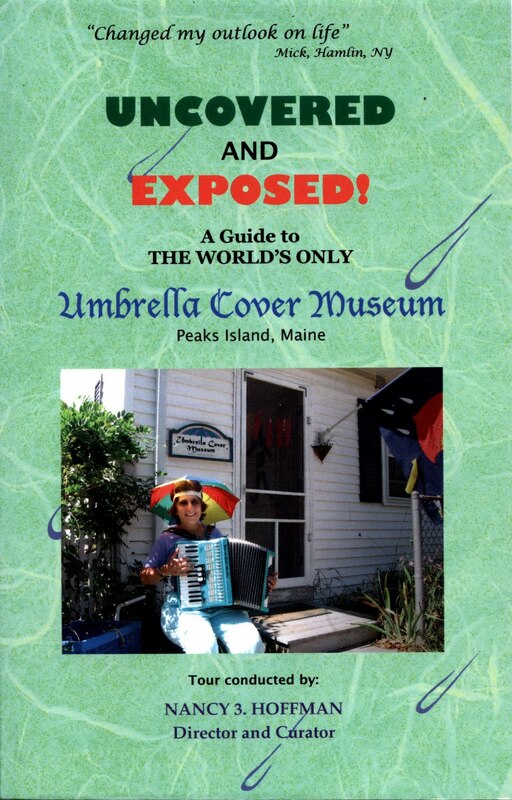 A Guide to the World’s Only Umbrella Cover Museum? Once again, Nancy 3. Hoffman has outdone herself. 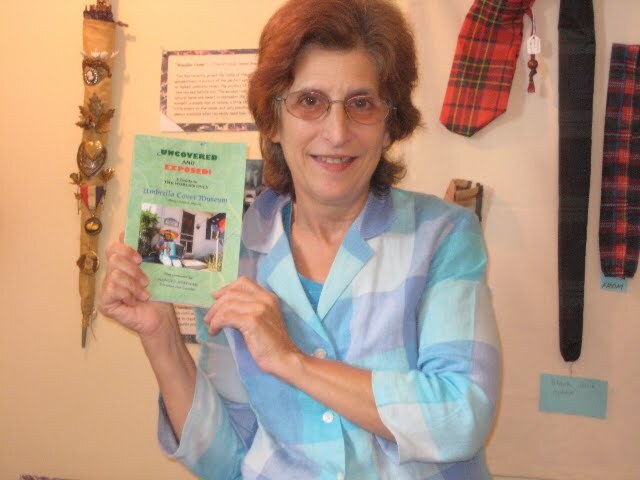 As director and curator of the Umbrella Cover Museum on Peaks Island, Nancy has long done her darnedest to remind the rest of us about the magic and delight that can be found in the most mundane objects. Now, as the author of this book, she is spreading the word even further than the shores of Peaks. Like the narrated tour she gives to guests of the museum, her guide is peppered with inimitable Nancy-isms and keen observations about umbrella covers and their reflection of our culture. From statistical facts about the mysterious little tabs (a.k.a. doo-hickeys) that appear on many umbrella covers to the battle with her word processor over whether or not “doo-hickey” should be one word or two, the guide sets out to entertain and educate us in fine fettle. The book is self-published in a sturdy square-bound format, and is packed with full-color photos of museum treasures and events. Like any good museum guide, it walks armchair visitors through the museum piece by piece, pointing out the items that might be missed in the midst of their normally distracting surroundings. Not only do you get to see the covers as documented by Nancy’s camera, but also you find out each piece’s provenance, which in some cases can be far more intriguing than their plain appearance would indicate to an uninformed spectator. Are you curious yet? The book is available at local bookshops or through the museum’s website at http://www.umbrellacovermuseum.org/ The museum reopens for the season in May, and can be reached by calling (207)766-4496. The best way to get there (unless you have your own boat) is to take the Casco Bay Lines ferry to Peaks Island, a pleasant 20-minute ride out of Portland Harbor.